Woooow.... I have a lot of family in Wyoming. 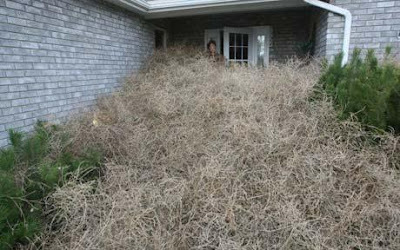 I wish we had tumbleweeds in Chicago. They should have massive community-wide bonfires. I think they should get a tumbleweed day, kind of like how some schools get snow days. I'm joking (or am I). Everytime I see a tumbleweed it's stuck in a fence, or on a cactus. My latest kitten is named Tumbleweed, because he's round. He's not nearly as prickly as the real thing. Sorry. We were just looking for a new home. Tumbleweed: That is SO FUNNY!! ROFLOL!!!!! Tumbleweed: lolz! I 've seen a leaf tumbleweed, if that counts... probably not. HEY! DONT DISS US!! WERE EVIL MASTERMINDS, YOU KNOW!!! i dont live in cheyenne, but i live close to it. at my school, one day extra windy day (all days are windy here)there were so many tumbleweeds stacked up you couldnt see past the fence. my firend started to use one for fencing w/ my other friends, but she got in trouble. tumbleweeds are old news here. they're a part ofeveryday llife. although i think everyone in cheyenne sould've gotten a weed day. i bet that hurt trying to get out. ouch. Oh no! I hope the tumbleweeds don't travel throughout the country! If they do, there gonna trap me in my house and I'll starve to death! WE'RE ALL GONNA DIE!!! WE'RE ALL GONNA DIE! AAAAAAAAAAAAAHHHHHHHHHHHHHHHHHHHHHHHHHHHH!